I received a complimentary box to facilitate this review. All thoughts are my own. Are you into stationery and sending cards in the mail? 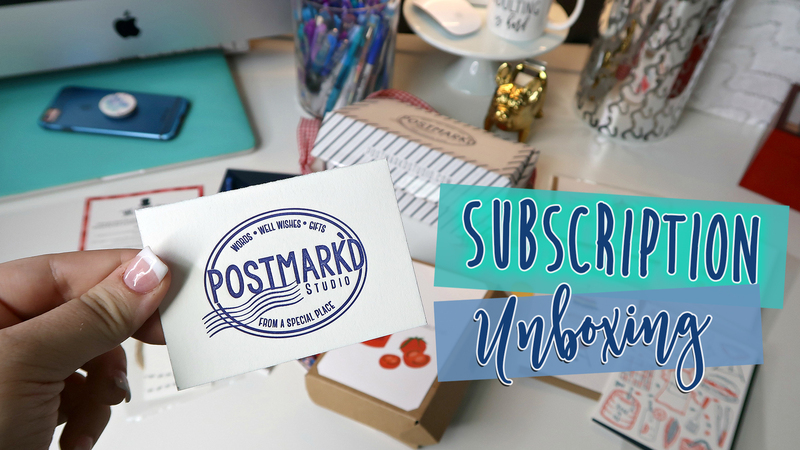 If yes, you’re definitely going to want to consider a subscription with Postmark’d Studio, a subscription that curates a box of themed stationery items and fun treats and ships them to your door monthly. The theme of the box that I received is Backyard BBQ and it was really cute! The thing that stood out to me most about this box was how everything matched and was packaged together nicely. I can tell that it was put together with care and the presentation was great! I think subscription boxes make fun gifts and I also think that gifted items should be presented well…..so this box definitely passes the test! Would you like to see what was inside? This box included a variety of greeting cards, all from different shops, that match perfectly! This box also included a Pigma Micron .08 pen (which writes really well) and a Postmark’d Studio pencil along with Matchstick Notelets (not sure where they are from), a few fun stamps, a Postmark’d Studio postcard, and some Ant Picnic Gift Tags from Lana’s Shop (retails for $12 for a set of 12). Retail prices of other items are unknown. The big item in this box was a fun gift set that has a card on top reading Let’s Catch Up and inside it holds a bar of specialty soap along with a little wooden soap dish from a shop called T.o.Y. [Thought of You Soap]. Retail price $13. Overall, the value of this Postmark’d Studio subscription box is at least $40. I wasn’t able to find all of the items to check retail value. The subscription starts at only $25 so it’s a great value for the customer! I love that all of the items matched the theme and colors perfectly and were packaged nicely. I think it’s a great way to discover fun, new shops that you haven’t heard of before. The quality of each item was great! If you are into stationery, or know someone who is, this would be a fun subscription box! Be sure to watch my unboxing video at the top of this post to see everything up close! For more information about Postmark’d Studio, or to start your subscription, visit www.postmarkdstudio.com! Do you like to send out cards? Tell me about your favorite types of greeting cards in the comments! FTC: I received a complimentary box to facilitate this review. All thoughts are my own.